January 2016 – DEWright Inc.
A combination of warmer-than-expected temperatures and lower-than-expected oil prices have contributed to a reduction in forecast average heating expenditures this winter (October-March) compared with EIA’s forecast in the October 2015 Winter Fuels Outlook. Each October, EIA produces a Winter Fuels Outlook that projects heating fuel expenditures for the coming winter (October through March) based on EIA’s forecast of fuel prices and the National Oceanic and Atmospheric Administration’s (NOAA) forecast for temperatures (as measured by heating degree days). As discussed in the October 2015 Winter Fuels Outlook, the winter of 2015–16 was expected to have lower expenditures than the winter of 2014–15. In the time since that outlook was released, the weather has been much warmer than expected and prices have fallen faster than anticipated, resulting in even lower heating expenditures as forecast in the January Short-Term Energy Outlook (STEO). Petroleum-based heating fuels, such as heating oil and propane, are used mainly in the eastern part of the United States. Heating oil use is concentrated in the Northeast, and significant amounts of propane are used in both the Northeast and Midwest. According to the January STEO, these areas of the country are expected to be roughly 20% warmer than last winter (Figure 1). At the beginning of the winter, the Northeast and Midwest were expected to be 13% and 11% warmer than last winter, respectively. However, January is typically the coldest month of the winter, and if January turns out to be significantly colder than forecast, averages for the whole winter will move closer to normal. At the national level, as of NOAA’s December forecast, the 2015–16 winter is expected to be 15% warmer than last winter, as the warm temperatures east of the Rocky Mountains are partially offset by temperatures in the West that are both slightly colder than previously forecasted and colder than last year’s relatively warm winter. In addition to the warm weather, falling crude oil prices and ample supplies of distillate fuel have contributed to lower retail fuel prices than forecast in October. Heating oil prices in particular have been weak, with the average winter 2015–16 retail price now expected to be $2.17/gallon (gal), down from a forecast of $2.57/gal in October. Last winter, retail heating oil prices averaged $3.04/gal. 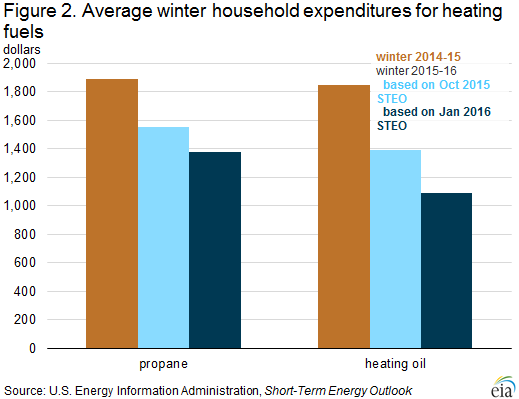 As a result, the average household that heats primarily with heating oil is forecast to spend $760 (41%) less on fuel this winter than last winter (Figure 2). Brent crude oil prices are the main driver of retail heating oil prices, and Brent prices fell from a monthly average of $48 per barrel (b) in October to an average of $31/b through the first 20 days of January. That $17/b price decline is equivalent to about 40 cents/gal. EIA did not foresee this drop in price in the October outlook. Crude oil prices fell sharply in recent months, as OPEC producers (at their December 4 meeting) indicated plans to continue the policy of defending market share in a low oil price environment and as global oil inventories continued to build, with the monthly average Brent spot price in December reaching its lowest level since mid-2004. Strong supply and weak demand globally for distillate fuel (a fuel category that includes products such as diesel and heating oil) have reduced refining margins for distillate, further contributing to low heating oil prices. EIA estimates that the refining margin for heating oil in January is about 28 cents/gal, the lowest margin in January since 2011. Slowing economic growth in emerging economies and a relatively warm winter have reduced growth in global demand for distillate fuel. Additionally, strong gasoline refining margins for this time of year have encouraged high global refinery runs. This combination of high refinery runs and slowing demand growth has resulted in high inventory levels in major distillate markets including Asia, northwest Europe, and the northeast United States. For the week ending January 15, distillate fuel inventories in the northeast United States were 51.8 million barrels, 55% higher than the five-year (2011-15) average. Retail propane prices have also been lower than was forecast in the October STEO. In the January STEO, EIA forecast winter 2015-16 propane prices to average $2.73/gal in the Northeast and $1.56/gal in the Midwest, down 12 cents/gal and 10 cents/gal, respectively, from the projections at the beginning of winter. These prices are also lower than last winter. Propane prices did not fall as rapidly as heating oil prices this winter because propane prices are partially tied to natural gas prices, which have declined but by less than oil prices. The link to natural gas prices occurs because a significant amount of propane is produced at natural gas processing plants and because propane competes in the petrochemical feedstock market with other hydrocarbon gas liquids produced at natural gas processing plants, such as ethane. 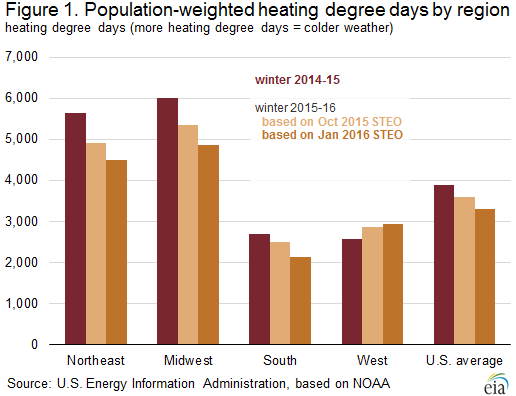 In the January STEO, EIA forecasts that households that heat primarily with propane will, on average, see heating expenditures fall by $540 (24%) in the Northeast and by $480 (31%) in the Midwest compared with last winter. The U.S. average regular gasoline retail price fell six cents from the previous week to $1.86 per gallon on January 25, 2016, 19 cents lower than the same time last year. The Midwest price was down eight cents to $1.63 per gallon. The West Coast price decreased six cents to $2.46 per gallon. The Rocky Mountain price decreased five cents to $1.86 per gallon. The Gulf Coast and East Coast prices each decreased four cents to $1.63 per gallon and $1.87 per gallon, respectively. The U.S. average diesel fuel price decreased four cents to $2.07 per gallon, down 80 cents from the same time last year. The Rocky Mountain and Gulf Coast prices each fell six cents per gallon to $2.02 per gallon and $1.96 per gallon, respectively. The Midwest price was down four cents to $1.99 per gallon. The West Coast and East Coast prices decreased three cents to $2.33 per gallon and $2.14 per gallon, respectively. U.S. propane stocks decreased by 6.2 million barrels last week to 83.7 million barrels as of January 22, 2016, 14.4 million barrels (20.8%) higher than a year ago. Gulf Coast and Midwest inventories dropped by 4.0 million barrels and 1.7 million barrels, respectively, while East Coast inventories fell by 0.4 million barrels and Rocky Mountain/West Coast inventories declined by 0.1 million barrels. Propylene non-fuel-use inventories represented 3.9% of total propane inventories. As of January 25, 2016, residential heating oil prices averaged $2.06 per gallon, 5 cents per gallon lower than last week and 75 cents lower than one year ago. The wholesale heating oil price this week averaged $1.07 per gallon, 7 cents higher than last week and 69 cents per gallon lower than a year ago. Residential propane prices averaged $2.02 per gallon, less than 1 cent per gallon higher than last week’s price and 35 cents lower than one year ago. Wholesale propane prices averaged 44 cents per gallon, 3 cents per gallon higher than last week and 19 cents lower than last year’s price for the same week. The Short-Term Energy Outlook (STEO) released on January 12 forecasts that Brent crude oil prices will average $40 per barrel (b) in 2016 and $50/b in 2017. This is the first STEO to include forecasts for 2017. Forecast West Texas Intermediate (WTI) crude oil prices average $2/b lower than Brent in 2016 and $3/b lower in 2017. However, the current values of futures and options contracts continue to suggest high uncertainty in the price outlook (Figure 1). For example, EIA’s forecast for the average WTI price in April 2016 of $37/b should be considered in the context of recent contract values for April 2016 delivery (Market Prices and Uncertainty Report), suggesting that the market expects WTI prices to range from $25/b to $56/b (at the 95% confidence interval). The confidence range for crude oil prices as shown in Figure 1 is derived using a variation of the Black-Scholes that is often used by financial analysts to estimate the price of options. EIA starts with options prices for WTI crude oil, and uses the Black-Scholes model to calculate the implied volatility. WTI futures contracts and options are the among the most actively traded commodity derivative products, with many producers, consumers (including refiners, airlines, trucking companies, and fuel distributors), and other investors and risk-takers involved. The confidence interval is thus a market-derived range that is not directly dependent on EIA’s supply and demand estimates. Continuing increases in global liquids inventories have put significant downward pressure on oil prices since mid-2014. EIA estimates that global oil inventories increased by 1.9 million b/d in 2015, marking the second consecutive year of inventory builds. This oversupply has contributed to oil prices falling to the lowest monthly average since mid-2004. Inventories are forecast to rise by an additional 0.7 million b/d in 2016, before the global oil market becomes relatively balanced in 2017 (Figure 2). The first draw on global oil inventories in 15 consecutive quarters is expected in the third quarter of 2017. EIA estimates that petroleum and other liquid fuels production in countries outside of the Organization of the Petroleum Exporting Countries (OPEC) grew by 1.3 million b/d in 2015. The 2015 growth occurred mainly in North America. EIA expects non-OPEC production to decline by 0.6 million b/d in 2016, which would be the first decline since 2008. Most of the forecast decline in 2016 is expected to be in the United States. Non-OPEC production is forecast to decrease by an additional 0.1 million b/d in 2017. Changes in non-OPEC production are driven by changes in U.S. tight oil production, which is characterized by high decline rates and relatively short investment horizons that make it among the more price-sensitive crude production globally. Forecast total U.S. liquid fuels production declines by 0.4 million b/d in 2016 and remains relatively flat in 2017. Forecast OPEC crude oil production increases by 0.5 million b/d in 2016, with Iran expected to increase production once international sanctions targeting its oil sector are suspended. Although uncertainty remains as to the timing of sanctions relief, EIA assumes the implementation occurs in the first quarter of 2016, clearing the way to ease sanctions at that time. EIA has moved up the anticipated implementation day because Iran has made faster-than-expected progress in meeting key obligations required under the Joint Comprehensive Plan of Action. Iran’s crude oil production is forecast to grow by about 0.3 million b/d in 2016 and by 0.5 million b/d in 2017. The growth of Iran’s crude oil production through the forecast period also depends on internal factors, including Iran’s ability to mitigate production decline rates and meet technical challenges, and on its willingness to discount the price of oil. At OPEC’s December 4 meeting, members voted to reactivate Indonesia’s OPEC membership after an almost seven-year hiatus. EIA therefore includes Indonesia’s crude oil and other liquids production in the OPEC total for both history and the forecast. EIA expects global consumption of petroleum and other liquid fuels to grow by 1.4 million b/d in both 2016 and 2017. Forecast real gross domestic product (GDP) for the world weighted by oil consumption, which increased by an estimated 2.4% in 2015, rises by 2.7% in 2016 and by 3.2% in 2017. The U.S. average retail price for regular gasoline fell three cents from the previous week to $1.996 per gallon on January 11, 2016, 14 cents lower than the same time last year and the first time since March 2009 that the U.S. average was below $2.00 per gallon. The Midwest price fell four cents to $1.82 per gallon. The West Coast and East Coast prices each decreased three cents to $2.63 per gallon and $1.97 per gallon, respectively. The Gulf Coast and Rocky Mountain prices both decreased two cents to $1.73 per gallon and $1.95 per gallon, respectively. The U.S. average diesel fuel price decreased three cents from the prior week to $2.18 per gallon, 88 cents lower than the same time last year. The Rocky Mountain price was down six cents to $2.13 per gallon. The West Coast price decreased four cents to $2.43 per gallon. The East Coast, Midwest, and Gulf Coast prices all decreased three cents to $2.23 per gallon, $2.10 per gallon, and $2.08 per gallon, respectively. U.S. propane stocks decreased by 4.5 million barrels last week to 91.9 million barrels as of January 8, 2016, 17.0 million barrels (22.7%) higher than a year ago. Gulf Coast inventories decreased by 2.9 million barrels and Midwest inventories decreased by 1.2 million barrels. East Coast and Rocky Mountain/West Coast inventories each decreased comparatively modestly, falling by 0.3 million barrels and 0.1 million barrels, respectively. Propylene non-fuel-use inventories represented 3.4% of total propane inventories. As of January 11, 2016, residential heating oil prices averaged $2.16 per gallon, almost 2 cents per gallon lower than last week and nearly 75 cents lower than one year ago. The average wholesale heating oil price this week is $1.09 per gallon, 9 cents lower than last week and almost 70 cents per gallon lower than a year ago. Residential propane prices averaged $2.01 per gallon, 1 cent per gallon higher than last week’s price and nearly 34 cents lower than one year ago. Wholesale propane prices averaged just over 43 cents per gallon, 2 cents per gallon lower than last week and nearly 14 cents lower than last year’s price for the same week. For questions about This Week in Petroleum, contact the Petroleum Markets Team at www.EIA.gov.